Every man knew who Leonard Cohen's Suzanne was. We had all once known a woman who could consume us, take us down to the river, and lead us astray with tea and oranges from exotic places. There was nothing new to that mythology and while Cohen was just identifying sirens firmly fixed in the past, it was still thrilling. The low, knowing rumble of his voice and the purity of his poetry avoided the comfortable popularity of Dylan's folk songs. Leonard Cohen was special and those of us who resonated to those songs felt special too. We may have not had the courage to follow Suzanne, but we lived vicariously in Cohen's mind, which freely did, again and again. Leonard Cohen died last week and we couldn't help but feeling just a little bit alone. After all, it hadn't been a great week for many of us. It was a grey week, tinged with the cold of winter, and the promise of foreboding. The chill of Cohen's passing merged perfectly - poetically - with the weather. In the spirit of things, we were reminded of this verse of Cohen's, an epitaph, in a way, far more hopeful than it seems at first blush. "If it be your will/That I speak no more/And my voice be still/As it was before/I shall abide until/I am spoken for/If it be your will"
succumb and, by doing so, we are made better. When we don't take that chance, when we cowardly protect our safety instead, we lose something. Nothing about Leonard Cohen's lyrics was ever safe. Perhaps, that's the point. A Leonard Cohen song rumbled down in your stomach, not up in your head. It was simple, unaffected, and gloriously dis- turbing. If it be your will, treat him well. He will be truly missed down here. In the push and pull of trial, there are rules, but most of them, for good reason, deal with the predictable. As in life, it's the unpredictable which causes us the real problems. That was the predicament in which a trial court justice found herself in Tate-Mitros v. MTA, 2016 NY Slip Op 07394 (1st Dep't 11/10/16). Plaintiff, who fell on the sidewalk due to an MTA articulated bus, was unable to convince the jury that the bus then crushed her right foot. The reason why, says plaintiff on this appeal, was that the trial court, among other things, improperly precluded her medical expert's rebuttal testimony. or of the right character to be those from an articulated bus. Defendant's accident expert then testified that the bus could not have mounted the sidewalk in the manner that plaintiff claimed. 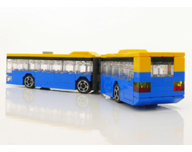 While the trial court allowed plaintiff's engineering expert to testify in rebuttal only as to the turning function of an articulated bus, this was of little help or hindrance to plaintiff's case. Any other error in truncating the engineer's re- maining testimony was "insubstantial" as it was related only to "minor issues that defendants did not rely on." However, the court's refusal to allow plaintiff's expert in biomechanical medicine to testify is reversible error and requires a new trial. Even though plaintiff may have delayed submitting his 3101(d) notice for his medical expert, that expert should have been permitted to testify in rebuttal. It was defendant's doctor who opened the door to the question of whether or not the claim of how the accident happened could have resulted in plaintiff's actual injuries; it was he who created the "necessity for plaintiff to produce a medical expert to attempt to rebut those opinions." While defendants never noted their expert's "no tire tread" rationale in the 3101(d), they were not required to. However, that set the stage for plaintiff's need for a rebuttal witness. "It simply cannot be presumed, had plaintiff been allowed to present his accident reconstructionist in rebuttal, that the jury would have found that plaintiff had not been injured by an MTA bus." Had defendants revealed in their 3101(d) the substance of their expert's testimony, they might not have to face a new trial now. Hoisted on their own petard, we'd say.